Aliens have shown up on Elite: Dangerous’ doorstep, and they have zero chill. This has provoked, among other things, an anti-alien arms race, as well as heated debates over whether or not wholesale slaughter is the right call. Amidst all that, one player is trying to communicate with the Thargoids, and he won’t let silly things like “what’s technically possible in the game” stop him. Elite: Dangerous player Benjamin "Heisenberg6626" Bahr, in collaboration with members of Thargoid alien investigation group Canonn Interstellar Research, recently made his first attempt at talking to the Thargoids. In a thread on Elite’s forums, he said that his actions were a form of creative outreach to the game’s development studio Frontier. Bahr has been researching Thargoids for more than a year, and “Project Mercury,” as it’s known, is the culmination of his work. 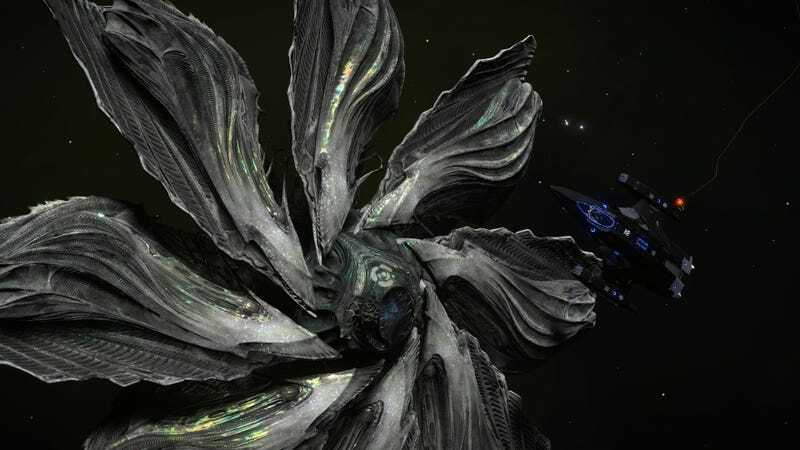 In short, he’s taken sounds emitted by Thargoid sensors in Elite, analyzed their structure, and reverse-engineered his own messages, which are made up of images converted into sounds. Today, he posted a video of himself delivering that message to a Thargoid in-game. Keep in mind, though, that because he’s role-playing, his sonic message is just part of the production of the video, as opposed to something he could tangibly execute in-game. Despite the fact that there aren’t actual game mechanics for communicating with Thargoids at the moment, Bahr still had plenty of material to work with thanks to all of Elite’s little details. Bahr plans to do even more in the future with Canonn Interstellar’s help. There’s just one problem, though: many players already consider themselves at war with the Thargoids, and they’ve got the “bug” splats on their ships’ hulls to prove it. Isn’t it a little late, I asked Bahr, to be claiming that we come in peace? “It is never too late to start talking to each other,” he replied, pointing to the Cuba Missile Crisis, the Cold War, and East/West Germany. “I think one reason why the Cold War did not become hot was because of the direct phone line between the US and the Soviets,” he said. There are trigger-happy humans and trigger-happy Thargoids, he added, but he believes cooler heads can still prevail on both sides. Even if Frontier keeps Elite on its current, arms-race-first, ask-questions-later course, though, Bahr doesn’t think his efforts will have gone to waste. This, he said, is his favorite way of playing Elite.